Random Felines: what was that?? Mom was off last Monday for a vacation day. She was supposed to go to TN to visit her family but there was a change of plans. Mom decided to take the day off anyhow. She ran some errands in the morning and had dinner plans with a friend. Since her afternoon was free she decided to take Chanel out to a garden center and invited Miss Z along (she is a volunteer with the rescue and fosters too). They spent some time at the garden center - which mom suspects will be more interesting as they get more plants in this spring. On the way home, Z invited mom and Chanel in for a bit. She and her partner have cats, but they are all pretty friendly. Mom left Chanel's harness on and figured if nothing else it would be a good experiment. The adult cats hissed at her first and she responded with a half hearted hiss in return but nothing out of the ordinary for being in a strange place with strange cats. Z was playing with Chanel and a wand toy when mom got a text from her friend about dinner. Time to leave, so mom scooped up Chanel to put her back in the carrier. She hissed at mom and struggled to get back down. 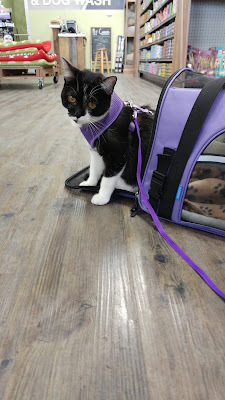 Mom was startled but got her in the carrier and got her harness off. Chanel whined all the way home and smacked at the carrier. Before we go any further, a couple of things: 1. if mom EVER thinks that Chanel is not enjoying going out in public, everything stops. This whole cat going places thing is based on her enjoying being out and about. 2. A normal trip for them is about 90 minutes. By the time mom was on the way home, they had been gone over 3 hours. Mom thought maybe Chanel had to pee or something. She gets home, carries Chanel upstairs and opens the carrier. Chanel pops out, does a lap around the living room, kisses Daiquiri and finds a toy. Guess it wasn't a litterbox issue. As she watched Chanel, she had a thought: she had just witnessed a teenage kitten temper tantrum. Chanel had been perfectly happy playing with the toy and mom ended her fun. Just to be sure, mom took her out this past weekend to a couple of different pet stores around us. Chanel did great - just like always. Though it must have been "take your dog to the pet store" day so mom and Chanel didn't stay either place very long. Guess she didn't want to leave all that fun she was having with her new friends. Glad she was all right the next time going out. Have a great day. Yep, sounds about right! We're glad she's enjoying her time out and hope it continues. We live vicariously through her experiences. I think being around all those other strange cats threw off Chanel. That's one of the reasons my human keeps bringing me to cat shows. I don't like getting too close to the other cats, but I am fine being among them (especially when so many people are making a big deal out of me!). Sounds like a great experience, even with some hissing and stuffs. Chanel is learning the limits, and we all know that you'd NEVER overtax her or put her in an unhappy situation. Chanel, your Mom sounds like a big meanie. 😉 I'm glad that you are able to take Chanel out, variety is the spice of life. Thanks for sharing her adventures with us. Sounds like Marie...got a little bit of a temper when she doesn't get her way! Awww! I totally understand, Chanel! Being a teenager is so hard!!! MOL, I know all about those temper tantrums. That was our first thought...that Chanel didn’t want to leave because she was having too much fun. Understandable on Chanel's part. Glad you figured it out and decided it was not such a big deal after all. Purrs. Teenagerhood is tough, isn't it, Chanel? Trying new things is the only way to find out whether you like them or not. It's just tough if you like them soooo much and don't want them to end!